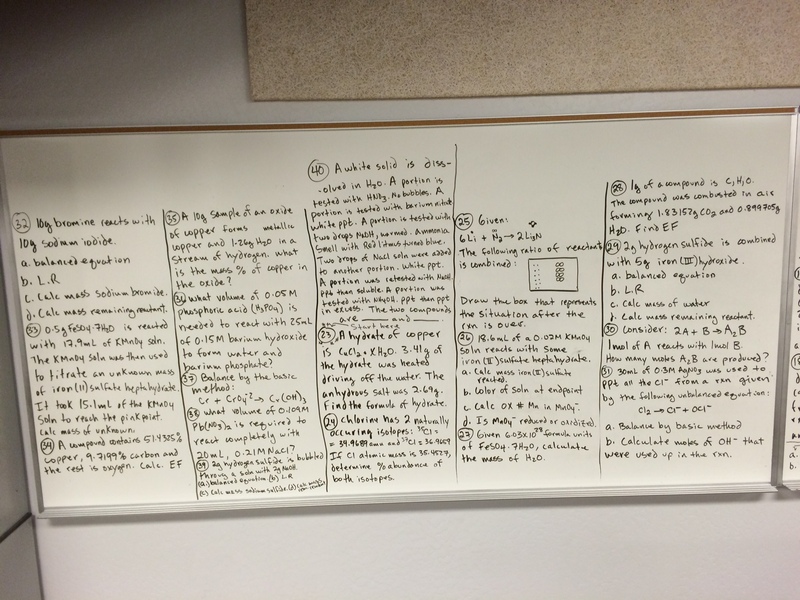 The purpose of the white board is for you to try a set of challenging problems that combine multiple concept areas. Try to complete the board within fifty minutes. Skip problems you cannot start and come back to them. After the set time period check your answers with the uploaded pdf. The important factor is to complete the follow-up. Look up the concept areas you had trouble with and do the hard intellectual work. Rock the boards! Wow these are really helpful!!! Thanks for using chemdoctor. I hope it helps you with your chemistry. If you need video support that you don’t see here, please ask and I will see about producing what you need. Thanks for visiting and I hope you come back. hi chemdoctor, I had a suggestion: maybe you could put a few examples on how to solve hydrates. I know a lot of kids struggle with that including me. You’ll find the video you requested under the link: naming ionic compounds. Hope this helps.